I am indebted to Fiona at Beauty Swapshop for sending me a couple of creams from Aldi. I am sure that I am not the only person who has read people raving about them on the internet and is eager to have a look themselves. A quick word about the packaging. Both creams are in glass jars with hard plastic lids. It might surprise you to learn this, but glass is often a cheaper alternative than plastic. Certainly an upmarket plastic cream jar will cost you more than a middle of the range glass one. For the end user the extra weight of a glass jar makes it less convenient in a handbag. The quality of the print is okay but this product really isn’t an oil painting. This is a product to use for its benefits not as a style accessory or a statement about the kind of person you are. 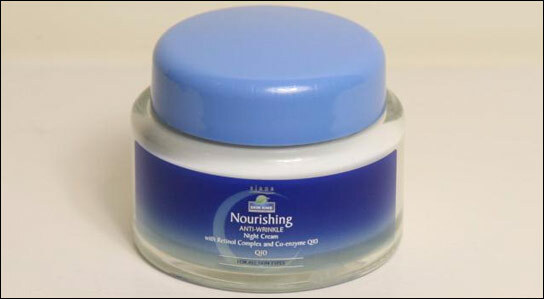 There are two formulations – a Nourishing Anti-Wrinkle Day Cream and a Moisturising Anti-Wrinkle Night Cream. The concept of a day and a night cream is a bit old fashioned nowadays but the logic still stands up. It makes sense to use a light cream during the day which can be quickly and easily applied. At night you can afford the time to apply a rich oily cream that can take its time to soak in. But both products are essentially doing the same thing. You put an oily layer on the surface of the skin which slows down the rate of moisture loss. The night cream rubs in very easily and vanishes into the skin almost instantaneously. The smell is very synthetic: I don’t think that the fragrance contains much in the way of natural ingredients. (See my post on spotting a good fragrance if you want to know how I worked that out.) I would be surprised if there was much oil in this formulation so my guess is that a small quantity probably isn’t that effective. Against that you have to allow that this is a modestly priced product that you can afford to slap on a lot of. The day cream feels oilier than the night cream. This seems a bit odd at first but seems to be down to the inclusion of sunscreens, which tend to have an oily in feel. But it rubs in well too. For me personally the fragrance is one that I don’t like. It isn’t too obtrusive though so it probably wouldn’t put anyone off too much. But do they work? I will carry on using them and see how I get on, but at the end of the day you’ll have to make up your own mind on that. But is there anything in the ingredient lists that can give us any clues. The day cream, as I have already said, has some sunscreens in it. These are likely to help prevent sun damage so should slow down the signs of aging. You only need to look a the difference between the skin you regularly expose to the sun and some that is kept covered to see the potential benefits. I have said elsewhere that I am not keen on chemical sunscreens. I would have preferred a physical sunscreen. Reading the small print they are claiming an SPF of 4, which for the purpose of slowing down skin aging on a daily basis sounds a reasonable level. The product also contains Q10. I really need to devote a whole article to Q10 at some point. I am not sure whether it does anything, but at least you are getting something for your money. Another ingredient that definitely does do something is panthenol. This is a good moisturising agent that can work well if used at a high enough level. Some vitamin E and vitamin C is also present. These can’t do any harm, and might be beneficial. The night cream contains a similar set of ingredients. They have left out the sunscreen. The sun doesn’t shine at night so this makes sense. They have included retinol. Retinol is the cosmetic active ingredient in which it is possible to place the most faith. It can be shown to reduce wrinkles in proper placebo controlled trials. They don’t quote how much there is in the formulation. You can get a very rough idea from the colour. A retinol cream with 0.1% retinol, the sort of level you need to get an effect, is yellow in colour. When I compare the Aldi cream with a cream I know contains 0.1% it looks to me like there is a much much lower level in the Aldi cream. I am going to stick my neck out and say that the Aldi night cream does not contain a serious amount of retinol. So, my overall conclusion? These are a nice pair of creams. I think they offer good value for money. I particularly appreciate that they have included an information leaflet explaining the ingredients – and from what I can see it is a reasonably accurate job. I think that if you are looking for a good cream for daily use I don’t see any reason not to recommend them. I do think that they aren’t as natural as they could be, and that you probably need to use them at a higher level than you might use some other creams that make similar claims. But all in all, a very respectable couple of formulations. You are very welcome to use the information from her Gerovital. I am glad you find it useful. I have been using Aldi’s day and night cream with Q10 for approximately one and one half years. I Love it. Today I stopped into the Aldi’s store to purchase both day and night cream and they did not have it. The clerk stated they most likely will not be getting anymore in. They did have other creams but not with Q10. I would like to know where I may purchase the creams with Q10. Your reply is appreciated and I Thank you. Sorry Madeline, but I don’t know.